Tis the season…for new cars? Please welcome the newest member of the “Cacciakins” family. Her name is Ruby. 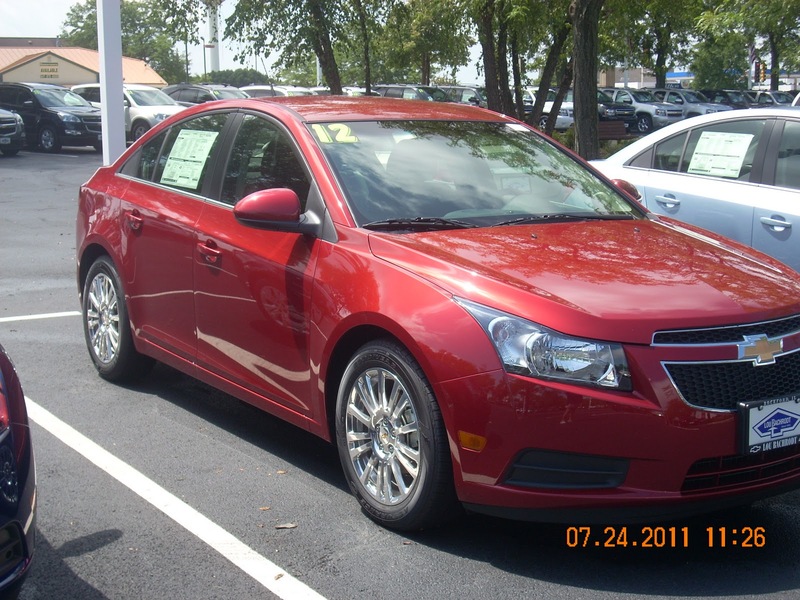 After months of talking about it, weeks of research, and about .001 second’s worth of deciding, we settled on a Victory Red 2012 Chevy Cruze. It has all the bells and whistles you could imagine…Bluetooth, Onstar, XM radio, ten thousand airbags (I think) ,a popcorn maker, lots of leg room and barely any miles. I had forgotten how much I enjoy the sheer total CAR INVOLVEMENT of driving a stick shift. I haven’t made one hands-on phone call or typed one text message. (not like I did before, mind you, or did I?) I haven’t applied any mascara or toted my morning coffee along, and believe me when I say I drink enough coffee that I should wear a sombrero and walk a donkey. We kept our old car, known affectionally as the Green Goblin, because, well, it’s a 94 Honda Accord, and the trade in value was approximately 27 cents. And that was the HIGHEST offer from the dealerships. I have made several completely unnecessary drives in that car, including a) taking my son to Family Video to return movies, when normally he would be told to do it his own damn self and b) driving to Hilander for garbage bags which we didn’t really need. Not only that, it’s a 10 minute round trip ON A BIKE, and that includes time spent chatting in the aisles. Currently I’m the primary driver, although I have let my husband drive it twice, park it once, move it several times, and of course, touch it. (carefully. with gloved hands.) With a round trip for me to work of approximately 16 miles per day, we don’t expect the mileage to add up very quickly, and of course our trips out of town will be in that car. A recent drive to Wisconsin revealed some very interesting things to us, including the fact that a) we get 50, yes, really 50 miles per gallon on the highway and b) that cruise control is a really, really, cool thing and c) that we enjoy the XM radio a lot and d) that we made the ONstar people give us directions for a place we have been to a lot, then snickered the entire way when the woman’s voice would say “bear left” and we didn’t actually see a bear ON the left. Oh, yeah, and that Wisconsin cops really are observant of new, shiny, red, fast cars. Have a very safe Labor Day, everyone! !